New Year's Eve is a super opportunity to present a "smorgasbord" of appetizers to friends and relations as you ring in the New Year. Similar to Spanish tapas dishes, these savory Nordic "small bites" and sandwiches will provide a tasty accompaniment to your celebratory bubbly or — for any children in your crowd — festive Skål Y'all. Scandinavia's most famous appetizer, cold-cured gravlax is a breeze to make, requiring only a few simple steps and next-to-no labor. 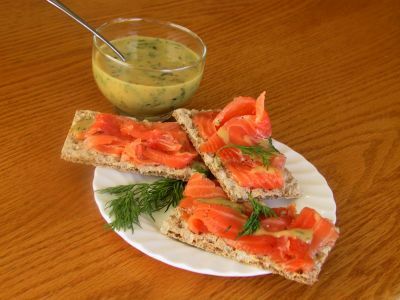 Sliced paper-thin and served on rye crispbread with sweet dill mustard, it is a necessary and delicious part of a New Year's smörgåsbord buffet. Cold-cured gravlax takes on a new dimension of flavor when lightly smoked for an hour or two before serving. It's an excellent alternative to provide for less adventurous guests who prefer their salmon cooked. Smoked salmon, ripe avocado, and piles of tiny baby shrimp contribute to the flavor and the beauty of this seafood smörgåstårta.